Find, Buy and Serve Featured Foods with our New Sourcing Guide and Recipe Book! From 2014 – 2017, each featured food has been accompanied by a product guide which contains helpful information on sourcing these foods from distributors and using them in recipes. Now, sourcing information and institutional recipes for each featured food are compiled respectively into two handy resources: Cultivate Michigan Sourcing Guide and Cultivate Michigan Recipe Book! 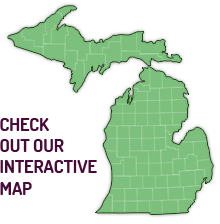 Current versions of each resource are always available through the "Cultivate Michigan Sourcing Guide" and "Cultivate Michigan Recipe Book" links below. The sourcing guide is designed to make it easier for institutions to find and buy more Michigan-grown foods. Then, you will be able to track your local purchases of these featured foods through the Cultivate Michigan Dashboard as we work towards reaching the goal of 20% Michigan foods in Michigan institutions by 2020. The recipe book provides simple and creative recipes for institutions that can help you turn your Michigan-grown foods into accessible meals for clients! Alternatively, information on each featured food can be accessed by clicking on the season icons below and the featured food icons that follow. A product guide and marketing materials are available on each featured food page. Cultivate Michigan - Logo, round (PDF) Please email us with questions about the logo use guidelines! Visit the season pages listed above and choose a specific product page for the purchasing guide, marketing materials and recipes related to each promoted product. Submit your favorite institutional scale recipes highlighting Cultivate Michigan Featured Foods. Recipes selected for inclusion in our product guides or social media posts will include the institution that submitted them and can be a great way to show off your farm to institution efforts!